This newsletter contains important information about the GeeDee software program. It is important that all users of the system receive and read a copy. Please forward this email on to all users in your office. To subscribe to this newsletter please click here. Please be advised that the new and current Build for GeeDee is 229 (07/02/2013). Please ensure that you are up to date with the most recent versions and regularly run your GeeDee WebUpdate. Areas updated with password protection. (Changes will automatically log and be added in the relevant Notes section). • Cheque Toolbox. Password required for next number adjustment as well as logging Notes in Trust Bank Account (Trust ID 00001). • Changing of Tenants Status to InActive or Active. Again records in Tenant Notes. • Tenant Card. Changing per field( eg per week) and changing current rent amount also records in Tenant Notes. • Cheque Toolbox. 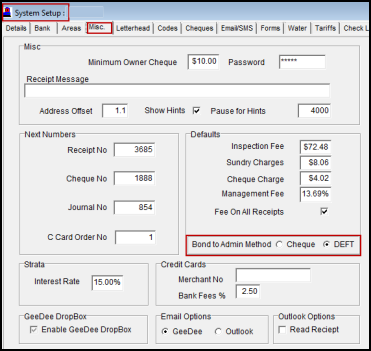 Now all Cheque Toolbox functions and changes record and log information in Trust Bank Account (Trust ID 00001) Notes. • Maintain Creditors. Any edit or changes to Bank Details now also records and logs information in Trust Bank Account (Trust ID 00001) Notes. • Bond to Administrator. 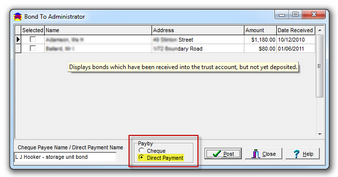 Default option to create a Direct Debit transaction in Statement Reconciliation. 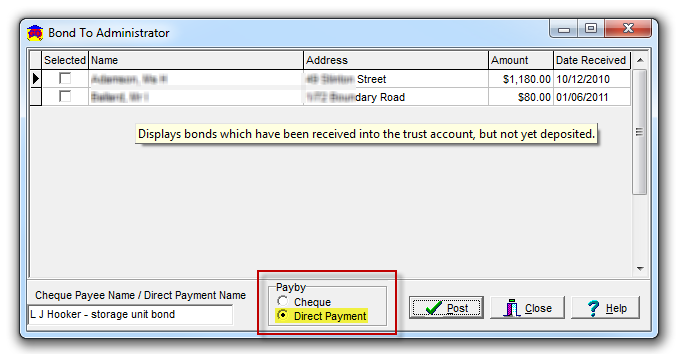 The Bond Adminstrator debits the Trust Account direct (upon your instruction).There is no direct payment file made for this, it just lists as a debit in the Statement Reconcilation. When it has been debited from the Trust Account it will appear on your bank statement, allowing flagging in GeeDee. • Bond to Administrator. Default option is created in System Setup. This can be changed to Cheque or DEFT under Misc. 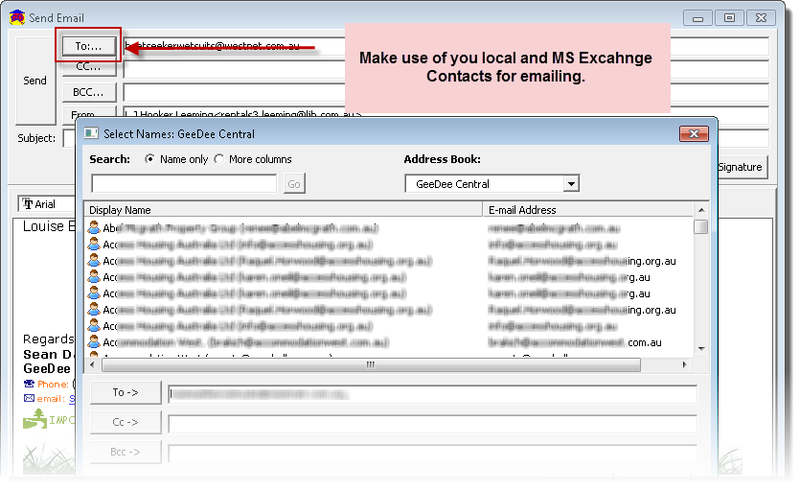 You can now elect to send emails from the GeeDee System using your local install of Microsoft Outlook. By checking the "Outlook" Email Option in System Setup Misc section, the GeeDee System will now send and store emails in Microsoft Outlook instead of the GeeDee Email Manager. 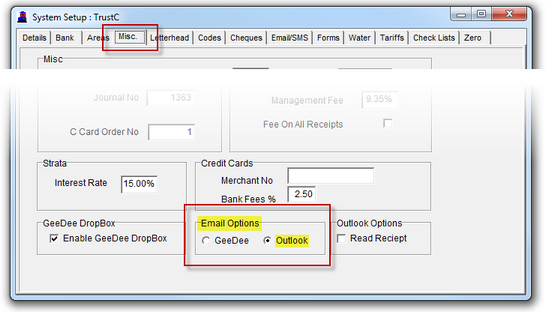 By simply selecting the above "Outlook" option, all emails will now be Handled by your Microsoft Outlook mail system. Note, this will work with Outlook 2003, 2007 and 2010 32-bit only. The 64 bit versions of Microsoft Outlook, like all current Accounting and third party communication software products, do not support 64 bit versions of Outlook. 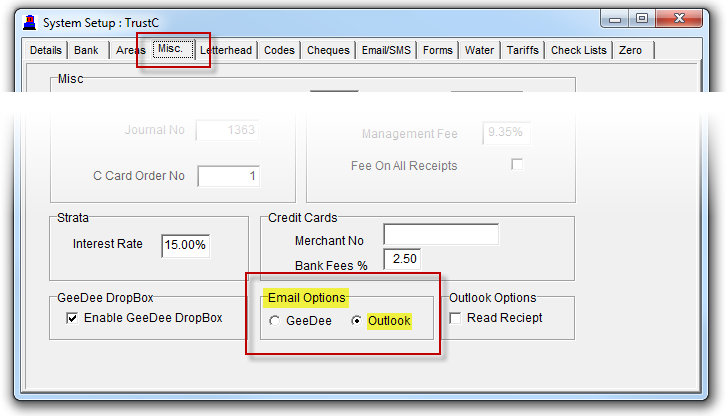 • How to choose your Default footer signature preference for MS Outlook. • STEP 1 - Double click any email field in GeeDee to open the "Send Email" window. (This is how you can change signatures). 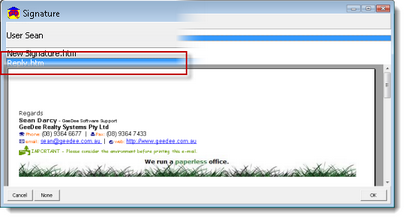 • STEP 2 - Select the Signature button to choose your preferred reply footer option. • STEP 3 - Select your Signature. Then Click on OK. Finished. 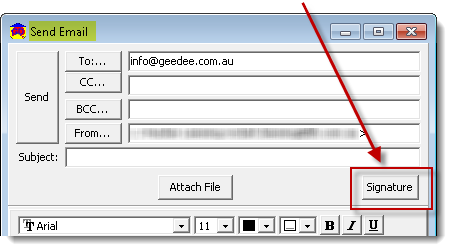 • NOTE1 - You can choose to use the default signatures from GeeDee. Select None to revert back to GeeDee default signatures. • NOTE2 - Please be sure that your images in the Signatures are in a .BMP, .JPG or .PNG format. .GIF will not translate correctly and you will just see a big red crossed box instead of an image. • As per previous exports for third party systems, please contact GeeDee Support Staff to activate the code and export. Example export screen shot of Inspection Manager information in Excel. Custom export, the filename is Inspection_Manager.txt (This is a CSV type file in text format). Backing up GeeDee Data Files - Ask your I.T. Professional if you are covered! Backing up your data is an important process that you need to perform on a regular basis. Familiarising yourself with the backup process will ensure your valuable data is secure and can be quickly restored if needed. Backups are also important for the purpose of retaining historical records and the ability to access information from previous financial years. Over the last two weeks we have been auditing newly installed Servers to discover that some additional backups being automatically performed on your servers are not operating correctly. Once only used by very large businesses, automatic backups are now happening in the small to medium sized business, too. In the past, two of the main roadblocks to setting up automated back-up systems were the cost and not understanding the technology needed to do the remote back-up. Today, there are many products available that will help you, are simple to use and won’t break the bank. The new GDMS (Document System) uses a "live" backup system and there is no need for users to exit the program while the backup is being performed. A snapshot is taken of the data from during the day. It is strongly recommended that users regularly copy the current data files to a piece of removable media eg: USB device, CD/DVD, remote offsite backup location etc. This information can then be taken "Off-Site" for safe keeping. Where are my GeeDee and GDMS data files that I am required to back up for security? 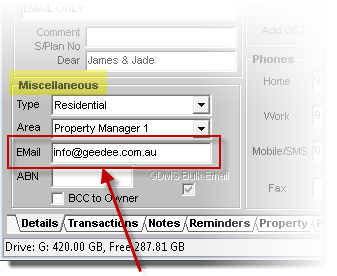 The GeeDee Realty Systems data files are copied to the folder Backup Location of - G:\Program Files\GeeDee\Proman\Archives\. When the feature is enabled, the GDMS data files can be scheduled to automatically copy to the folder Backup Location of - G:\Program Files\GeeDee\ArcServer\SvrBackup\ and current data files are located in G:\Program Files\GeeDee\ArcServer\DB\. These are the folder locations that you need to be sure are being backed up by your I.T Professionals! Consider the storage media being used to store your backups. Due to the reliability and efficiency of the various high capacity storage media now available, we no longer recommend you use floppy disks for secure backup purposes. Recordable CDs/DVDs or USB storage devices are a better option. Make multiple copies of your backed up data and store one or more copies of it off-site. This is especially recommended for backups taken at critical times such as immediately prior to starting a new financial year. How often do I need to backup my company file? Ideally, your company files should be backed up after each session, with the Session Report printed before closing the file. Should something happen to your company file, you will be able to restore the backup of the last session and then use the Session Report to enter the missing data. On a day to day basis, a backup of your company data files should be sufficient, but it is good practice to regularly have your I.T. professional perform a full backup of all data. GDMS data files Backup Location - G:\Program Files\GeeDee\ArcServer\SvrBackup\. GDMS data files DB Location - G:\Program Files\GeeDee\ArcServer\DB\. GeeDee data files Backup Location - G:\Program Files\GeeDee\Proman\Archives\. GeeDee data files DB Location - G:\Program Files\GeeDee\Proman\Trust\. This location can sometimes vary! Please confirm with staff or GeeDee Support. Please advise your I.T. expert of the above folder locations for additional manual/remote offsite backups! Avoid the devastating consequences of data loss by creating highly dependable backups of your valuable files. Many paid for products exist. StorageCraft, Easeus, Norton, Windows Backup etc... Please discuss with your I.T. person for your best option. Free backup, disk imaging and cloning solution for personal and commercial use. Protect your data, upgrade your hard disk or try new operating systems in the safe knowledge that everything is securely saved in an easily recovered backup file. Macrium Reflect supports backup to local, network and USB drives. Macrium Reflect 7 Free Edition is ready to download now and has a number of additional features not available in version 6. It is now licensed for both home and business use. Ensuring you can get desktops and laptops online quickly after a disaster is a critical priority for today’s businesses, large and small. StorageCraft® ShadowProtect® Desktop protects everything on your desktops and laptops: operating systems, applications like Microsoft Office, configuration and personal settings, and data. All clients MUST have Symantec pcAnywhere installed on their computers. This is part of the agreement when choosing GeeDee as your preferred Trust Account System. If you have had new computers or a new server please ensure you reinstall pcAnywhere or ask your IT person to reinstall as it is a requirement of our company. If you an old version of Symantec pcAnywhere it will not be compatible with Windows 7 as such you would need to upgrade to version 12.5. There is a way to assign a static drive letter to an external USB drive so you always get the same drive letter for that drive! To begin, locate your Computer icon in Windows Explorer. 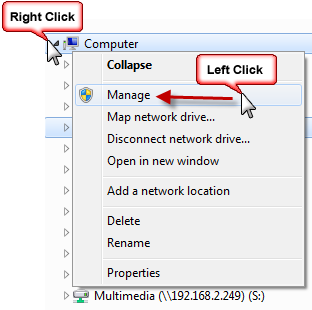 Right click the Computer icon and then left click and select Manage with a left click. The Computer Management dialog box displays. In the tree on the left, select Disk Management under Storage. 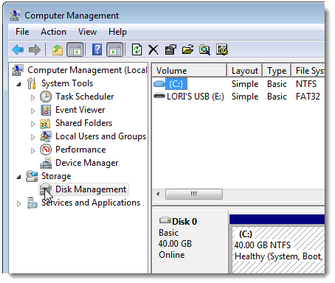 All your drives are listed in the top pane of the middle section of the dialog box, including removable media. 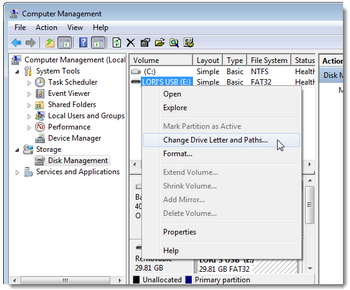 To change the drive letter for a USB external or flash drive, right-click on the drive in the list and select Change Drive Letter and Paths from the popup menu. 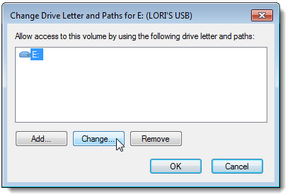 The Change Drive Letter and Paths dialog box displays for the selected drive showing the current drive letter. To change the drive letter, click Change. NOTE: It is best to select a letter between M and Z (inclusive). If you pick a letter like E, F, or G, the drive letter may still change frequently because these letters may be used for other drives, like CDROM drives, that are not always connected. The following warning displays. 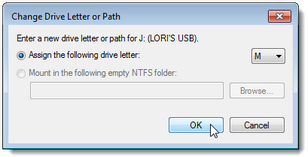 If you have some programs that rely on an absolute path to your USB external or flash drive, be sure to change the drive letter on the path to the drive in the program to the letter you selected. The new drive letter displays next to the drive on the Computer Manager dialog box. 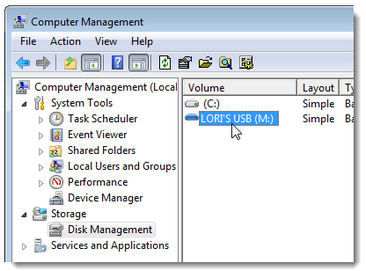 Select Exit from the File menu to close the Computer Management dialog box. Close both the Administrative Tools window and the Control Panel window by clicking the X button in the upper, right corner of the window. Now, absolute file paths used by programs, such as backup programs, won’t have to be changed every time you plug in your USB drive. © GeeDee for Windows Pty Ltd 1984 - 2019 All rights reserved. Real Estate Software by Real Estate Professionals. 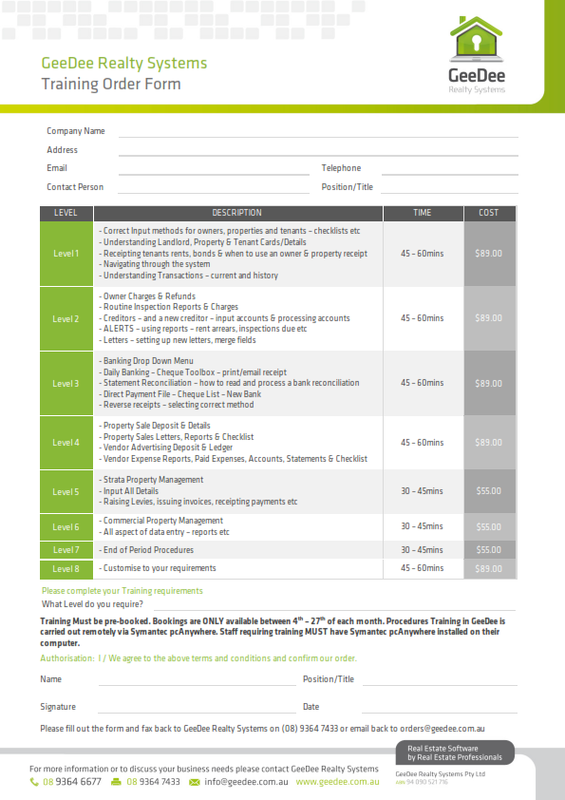 Trust Accounting & Property Management Software with Enterprise Electronic Document Management.